We did it! We got off the dock. We began to live our dream today! Family photo a few minutes before leaving Seldovia for a year or more. 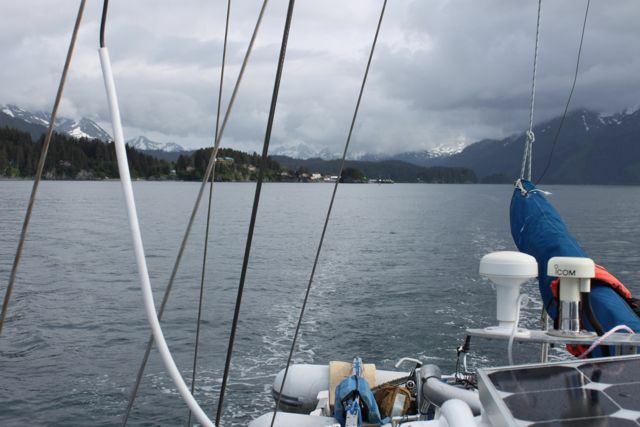 Underway, heading out of Seldovia Bay. Over the past year of hard-core planning, organizing, saving money, working hard, and procrastinating, it seemed as if this day would never come. The past many weeks consisted of very little sleep and massive amounts of creating and ticking off to-do lists, completing home projects, packing, purging, building and installing new boat systems, finding foster care for our dog, loaning out our cars, and throwing away a humungous dumpster full of 12 years worth of living in the same place, we finally left our home in Anchorage, Alaska three weeks ago, and today we left the port of Seldovia, Alaska to sail the seven seas (or at least two or three). Boat kids, Richard and Carmen posing for the reporter. “It all began when . . . .” 15 years ago, Bruce and I met while living aboard sailboats (each in our own boat) in Jersey City, NJ. 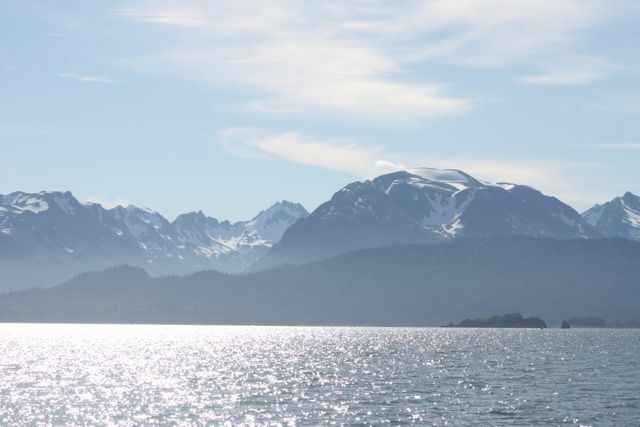 Long story short, and it is a very long and messy story, we fell in love and moved to Alaska. During the time of courtship when newly in-love couples talk about dreams, ideas, fears and desires, over wine at dark restaurants and midnight hikes in the Chugach mountains, we realized that we both wanted to sail the world with our family one day. A few years later, we were married, we had two children, owned a house, had a dog and cat and two cars. We settled into what appeared to be a traditional middle-class life. However, late at night we took our laptops to bed and shopped online for the sailboat that would one day take us out of that world. About three years ago, we decided to call our dream a Goal. Changing the terminology somehow made all the difference. 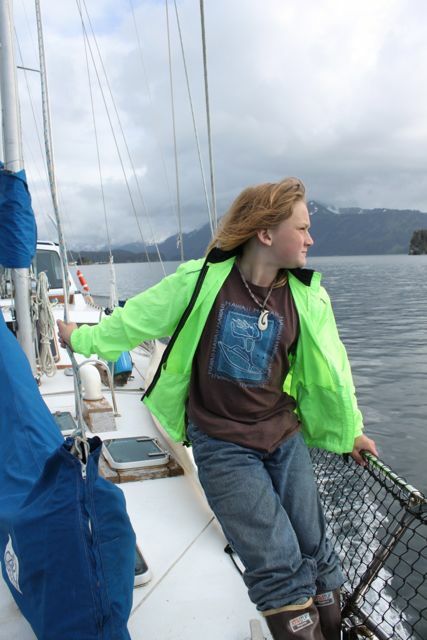 The plans started to take shape, the kids grew to just the right ages, and eventually the boat became available. 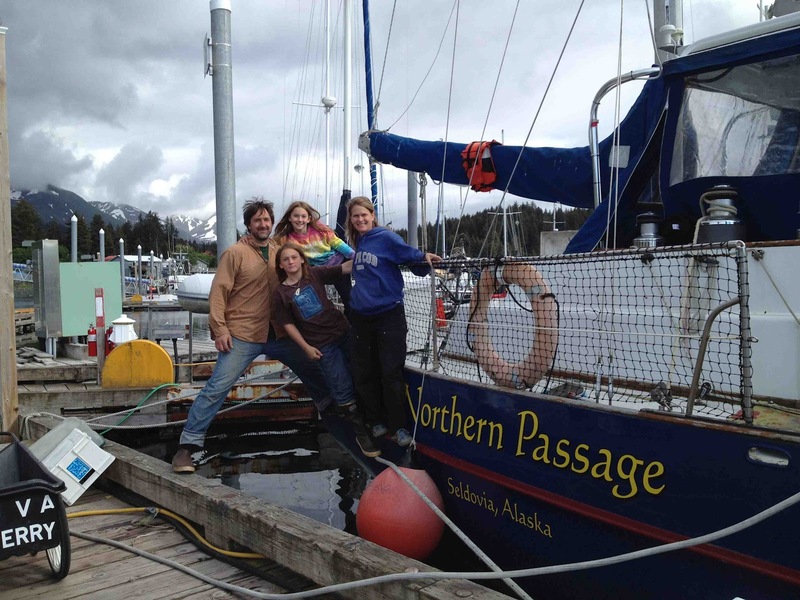 We found “Northern Passage” in California and sailed her to Seldovia, AK in 2010. Two years later here we are, underway. We departed four days off schedule – not bad considering the date was set about a year ago. 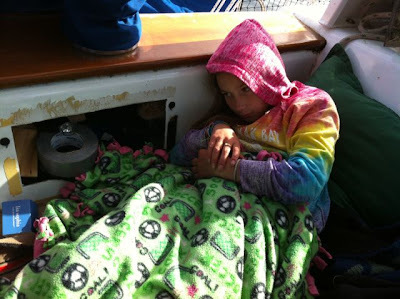 Our first setback came when, 10 days ago, we discovered seawater pouring into the boat when we ran the engine! Luckily we were at the dock, able to determine that the guilty part had frozen over the winter and cracked open. We flew the part over to Homer, AK (a 15-minute bush plane flight) and Alan at Otto’s repair rebuilt it. We have very much gratitude for experts like Alan. 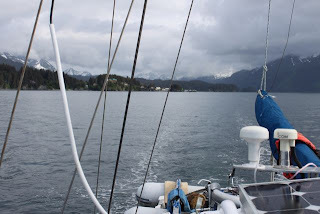 Looking ahead, heading out of Seldovia Bay. 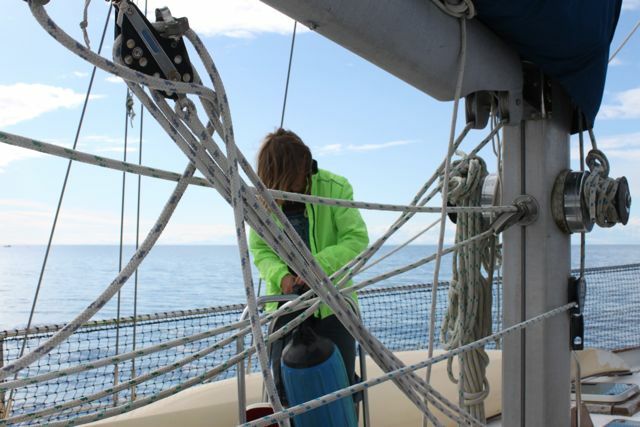 First Mate tying up fenders. Now, we head out under blue skies (it has been raining for weeks in Seldovia), with calm seas and practically no wind. 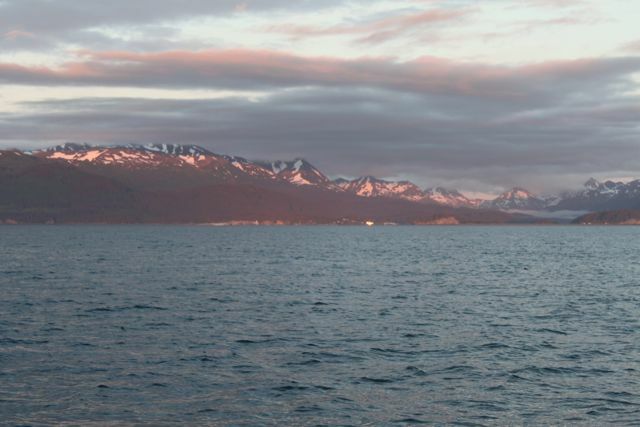 A beautiful evening and a departure with no fanfare. Carmen hanging with Tiger (in the hole on the side). 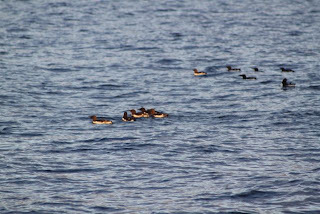 Not a great picture, but seabirds are everywhere, flocking and chatting. At first grateful for calm seas, soon we were wishing for more wind when our ENGINE STOPPED WORKING about two hours into our journey, just as we turned south! It was a nice quiet petering out, as if it ran out of deisel. And what impressed me most was that there was not one ounce of panic aboard. 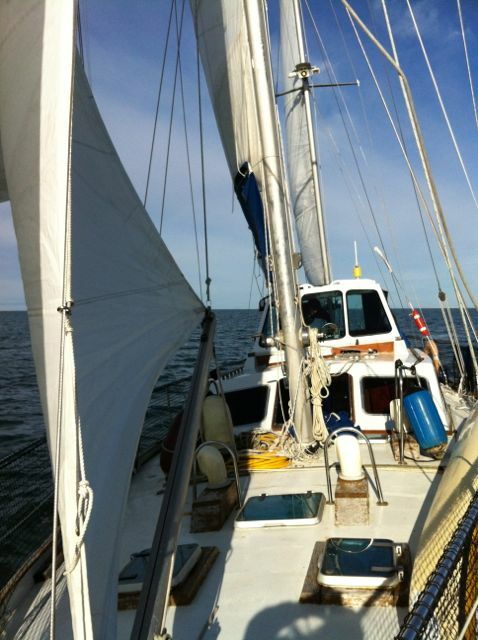 Bruce went below to the engine room while Richard, Carmen and I raised the sails and we began to move with the slight breeze, under sail and completely in control. When Bruce emerged half an hour later with a furrowed brow, I knew the engine prognosis was not good. His guess was that there was air in the fuel line, but he couldn’t trace it. 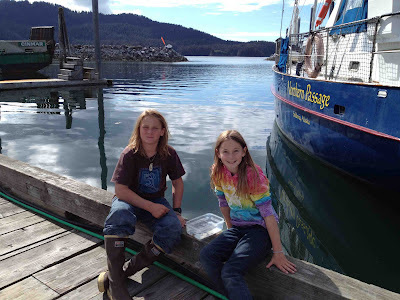 So we had to make a decision – go back to Seldovia with our tail between our legs and with no promise that a diesel mechanic would be there to help, or go about 16 miles further north to Homer, where there would definitely be services and the ability to tow us into the docks. We opted for Homer, I think more because of pride than anything else. 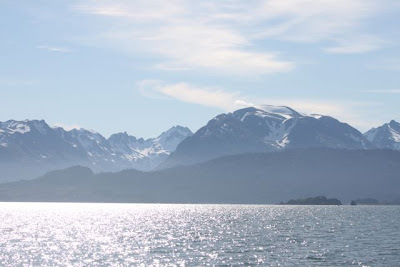 It seemed like part of the adventure to go to Homer, whereas Seldovia would have felt like going backwards. 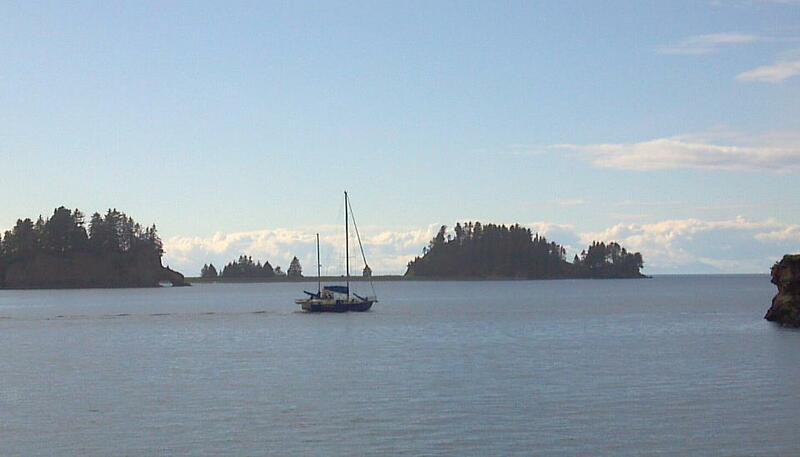 As you can see in this picture above, Seldovia is to our East versus our west. 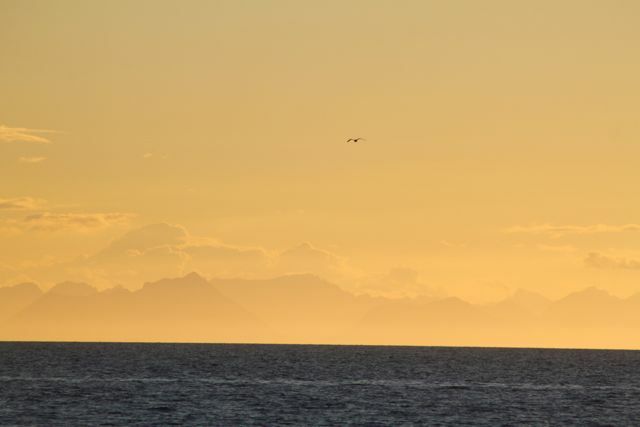 Although we are going to wrong direction, it is a beautiful view of our favorite seaside Alaskan town. 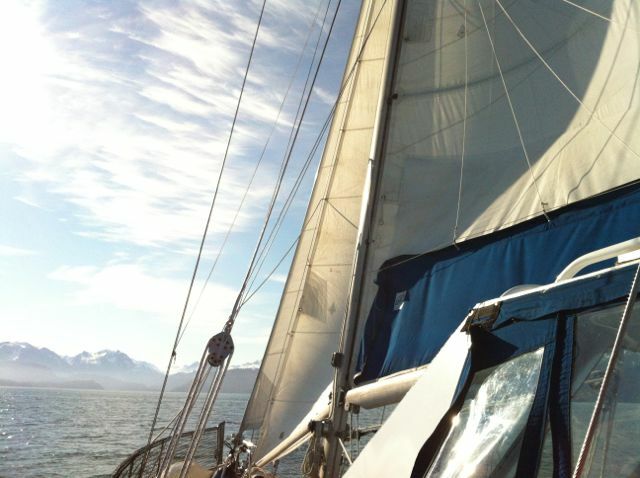 Thanks to Alaska’s 20 hours of daylight and clear skies, we were able to sail/drift for 14 hours to Homer overnight without losing visibility. 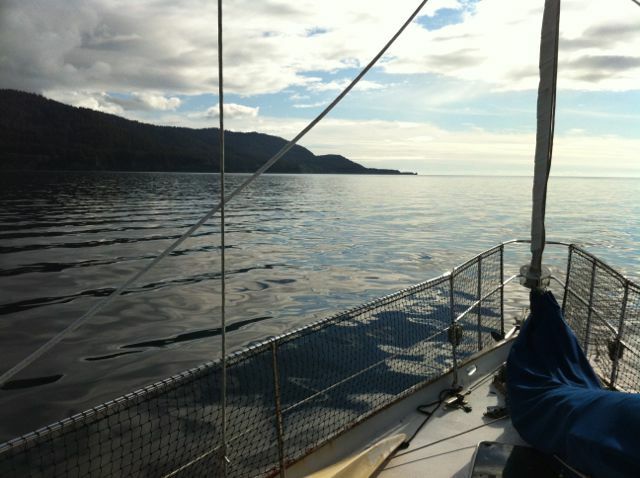 The kids went to sleep, peacefully drifting off to with the quiet bobbing of our boat under sail. 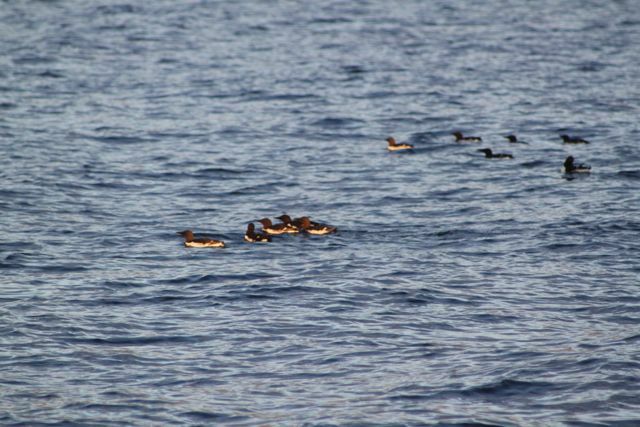 Meanwhile, the sunset, bird calls, and glassy waters were spectacularly beautiful. If we hadn’t gone many nights with only a few hours of sleep, the overnight shift wouldn’t have been so difficult. 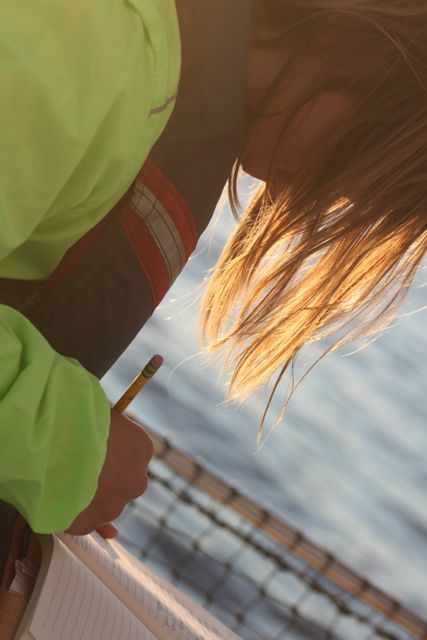 As it was, we called the coast guard at about 3am, when the lack of wind and current started making us spin in circles, and we thought it would be a good idea for someone to know we were out there. 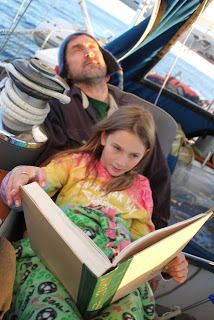 They kept us awake by calling every hour or so, and we very slowly, like the turtle, averaging about 2 knots, made our way to port. 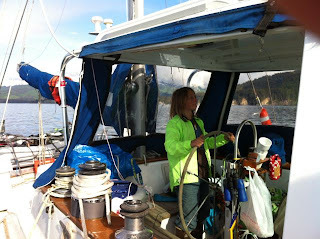 By about 9:00am the next morning the wind picked up and we were able to sail for two hours into Homer Small Boat Harbor (except for the last few hundred yards, when we were towed to the docks). The perfect wind and sunshine seemed like a reward for making it through the slog of the night before – a crisp wind, sunny skies, we had all four sails up and a very happy crew (two smaller ones thoroughly rested and the other two thoroughly exhausted). 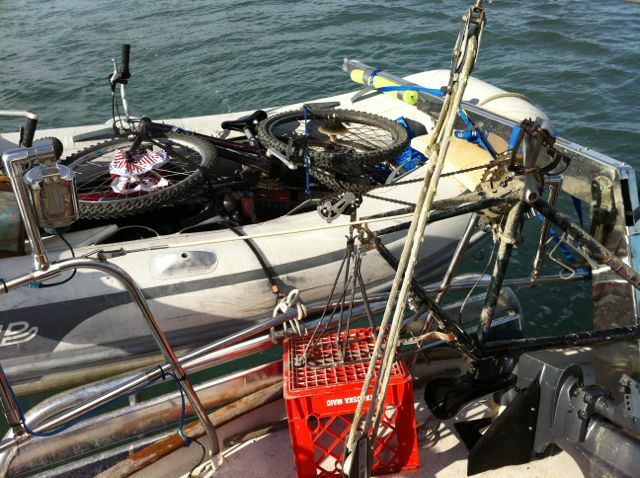 Once in Homer, our decision to bring four bicycles proved invaluable, we made the right decision – YEA!! After two days at port getting the engine repaired (it was an easy fix and a good lesson learned) and doing laundry, we set sail again on Thursday, the 12th. Incredible Jen! I just read the passage about losing the engine but keeping your cool! Well done! Thinking of you! Hello from Carrie Mckenzie's dad and step mom, Arno and Linda Schubert. 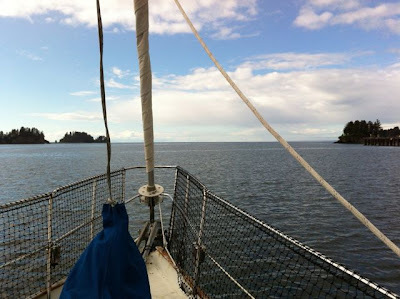 Carrie forwarded your blog and now we look forward to following your adventure. Good thing you got the "bad" stuff out of the way early. We will be keeping you in our prayers. I'm sure some questions will come up and hope you won't object to us "dropping in" once in a while. Really looking forward to your next post. Where are you bound? Would you mind if I picked your brains about how accomplished this sometime? 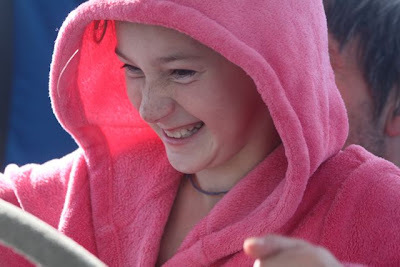 Enjoyed reading the blog entries and thanks for posting so many pictures. Wishing you smooth sailing on this adventure! Congrats on getting off the dock. We are so proud you made it happen! Our hearts are with you on this wonderful adventure for your family! PS. Sooo glad Tiger is with you. Good company for keeping watch. I was so happy to get your email and see you had made it off on your journey! i will be happy to follow your trip and her the stories as the adventure unfolds.